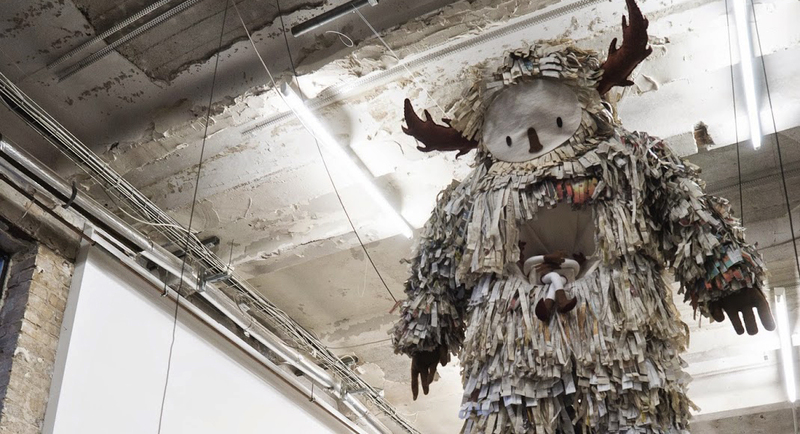 Berlin’s one and only paper monster has migrated from its home patch in Kreuzberg. After almost two years in the late late store in Adalbertstrasse and many tender farewells it is already sorely missed by the shop owners and customers. It returned to its maker, the artist, Carolina Cruz aka Lucilux, for refurbishing — and emerged freshly fringed with heartwarming offspring. 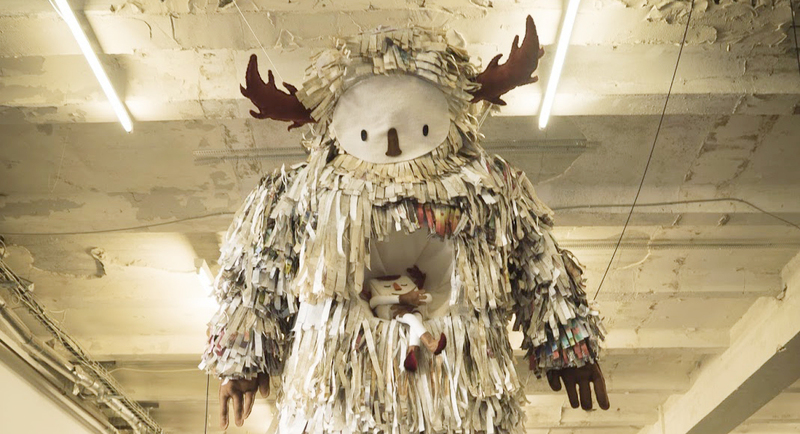 It was ready to resume its odyssey as a migrant paper monster. 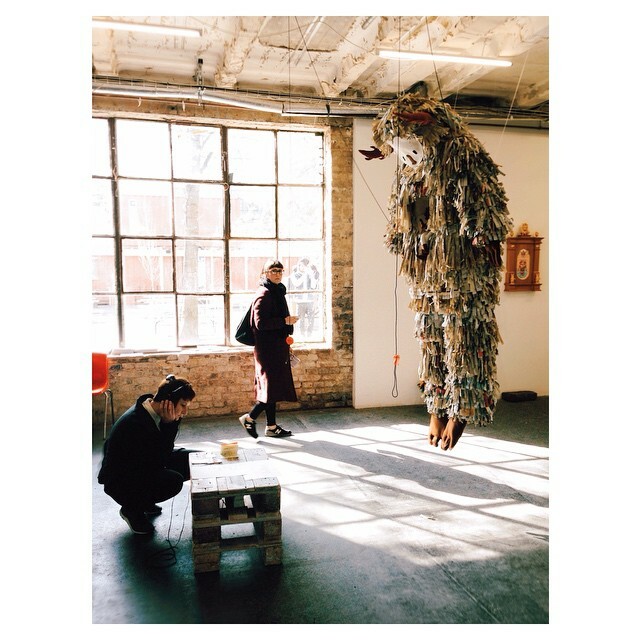 Its first short stay in its new guise took it to a prime place in the Friedrichshain scene — Urban Spree, an arts playground where the Pictoplasma Festival held a show from 29 April-3 May 2015. 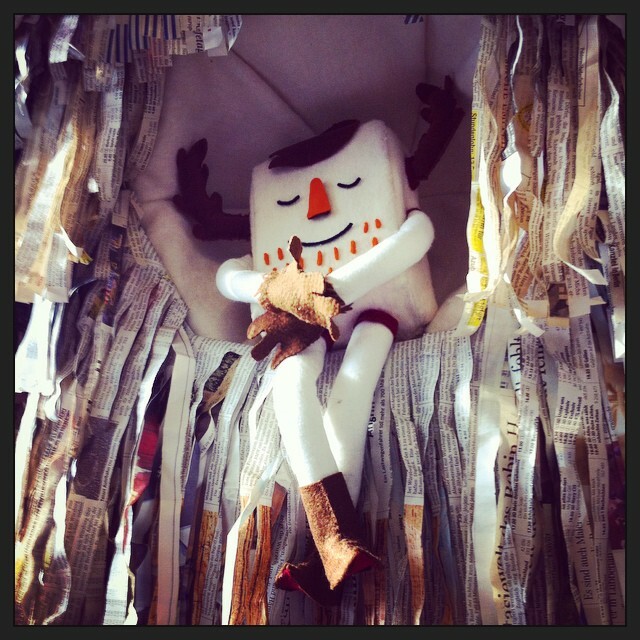 Carolina carefully cut newspaper into strips and built the Paper Monster. It started to feel like a character from poetry or song. It grew like an ancient being reborn into the modern world to revive dreams of a natural past. Its eyes looked into the digital future while its whole being pleaded for an end to the waste of real life in real time. 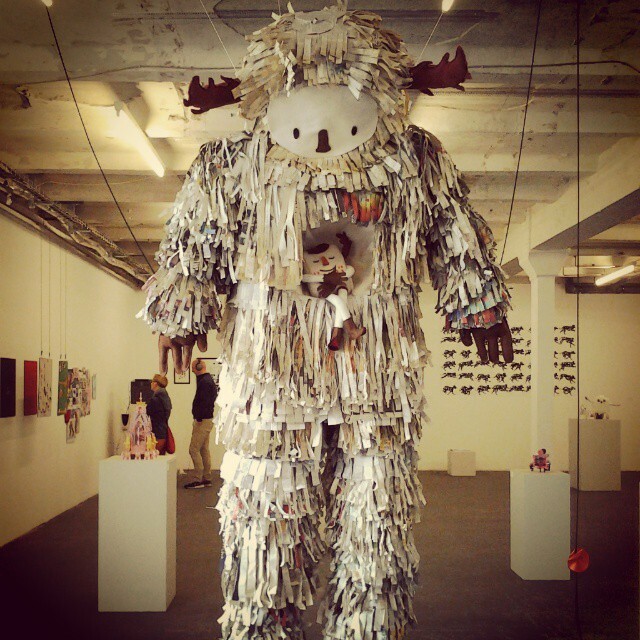 The Paper Monster’s first outing came in Carolina’s natural habitat in the district of Kreuzberg in Berlin. In 2013 Carolina co-organised the Late Late Store (Spätkauf Kunstaktion) Festival in Kreuzberg and Neukölln. Local artists, many of them visiting or migrants from outside Germany, linked up with late store owners to decorate and give an artistic ambience to the newspaper racks, bottle-filled shelves, packet noodle soups and other goods in the local late late stores. All a popular boost to slow summer trade in the art and retail sectors. Berlin’s artistic enterprises are a constant joy and surprise. Carolina asked me to write a poem for the Paper Monster’s first show. Occasional poetry is a wonderful way of marking events. Give it a poem and you make it special. And multimedial. The exhibition opening at the Adalbertstrasse Späti late store in August 2013 was multi-multi-national and unforgettable. The Chilean, Turkish, Greek and US turnout was an extra bonus. 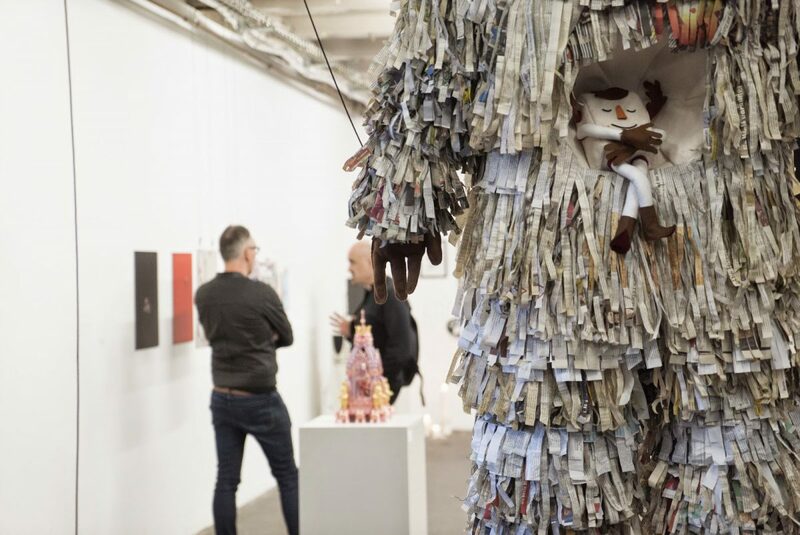 With a backdrop of multicoloured bottles, the Paper Monster hung over the display refrigerator and the heads of the vernissage crowd and heard its theme poem read live. Later the tape reel of tweeting birds, rustling leaves and the recorded voice reading the Paper Monster poem was turned on. The shop owner asked for a German translation. A Turkish one would be even better, he added. And at best, both. He told me he fell in love with the monster at first sight. He was extremely proud to be hosting it for the festival month. In fact, he would be sorry to see it go. 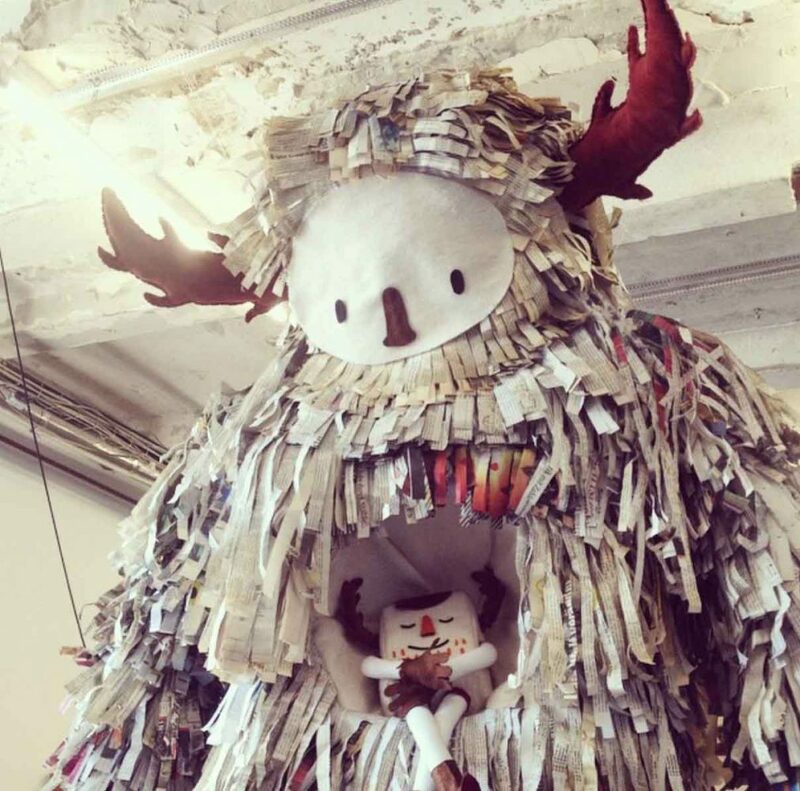 Nearly two years later, Paper Monster morphed into the next phase of its promising career as a legendary urban art figure. It wasn’t easy to uproot from being the cosy neighbourhood mascot in the media limelight between warring fronts. Social police projects, drug mafias, property investors, pop-up events and an unstoppable subculture that breeds news shoots whenever anything is lopped off. Still, the Paper Monster was fraying at the edges and it was time to go. 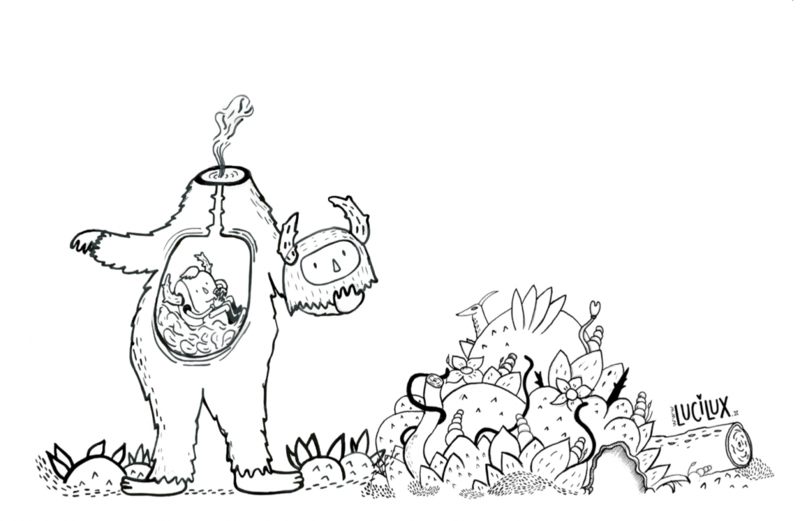 The 2015 Pictoplasma Festival in Berlin gave Carolina Cruz the chance to add a new phase to Paper Monster’s biography. In its earliest days the Monster lay growing on sheets on her living room floor. 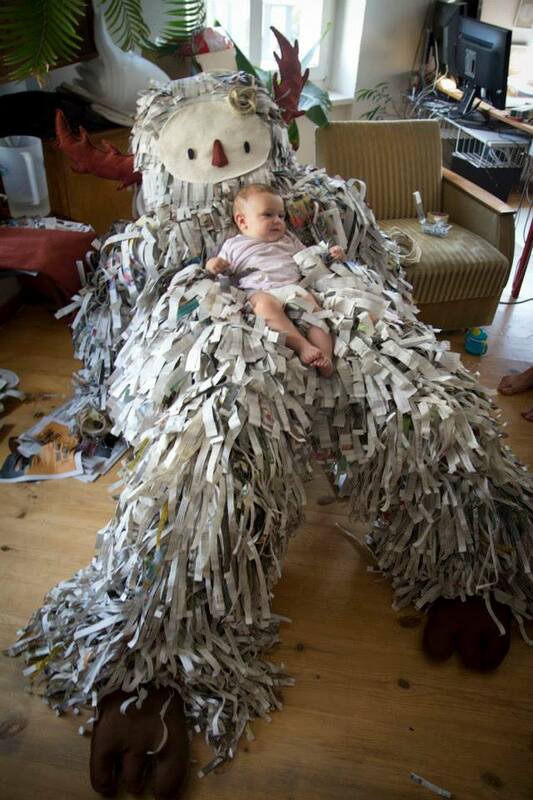 Sometimes Carolina laid her new baby daughter on top to feel the softness of the masses of fringed newspaper that give the Monster its unique furry papery feel. Carolina prepared the Monster carefully for its appearance in Friedrichshain at the Festival show dedicated to the Academy’s master class. As she cut and pasted the old newspaper, a new figure was born: the Baby Monster, as yet unnamed as far as I know, but so appealing that visitors to the opening on 29 April uttered just one word: SÜSS (if they were German), SWEET (if English-speaking), or DULCE if they were native Spanish speakers like the Paper Monster’s maker.